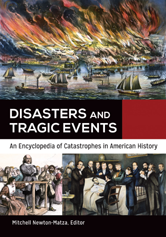 Unlike other works that concentrate on a particular type of disaster, for example, weather- or medicine-related tragedies, this two-volume encyclopedia has no such limits. Its entries range from natural disasters, such as hurricanes and tornadoes, to civic disturbances, environmental disasters, epidemics and medical errors, transportation accidents, and more. The work is a perfect supplement for history classes and will also prove of great interest to the general reader.